Here at Regal Animal Hospital, we offer safe and comfortable boarding accommodations for your dog and/or cat family members. Whether it’s a short term or extended stay for vacation, home remodeling, a business trip or other life events, our accommodations are convenient and affordable! Searching for dog boarding near me? Look no further! 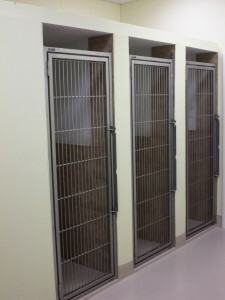 Our kennel area is in a separate room and away from the movement and noise so your dog will be happy and stress-free while staying at our clinic. Soft music plays through overhead speakers to further help soothe your pet. Be sure to let us know if your dog might chew up and swallow bedding and/or toys so we can keep them out of the kennel for safety purposes. The dogs will be walked and interacted with three times daily and if they have special needs or circumstances we are happy to try and accommodate them as well. We can supply your pet’s food (use Science Diet Adult dry) or you can bring your pet’s regular diet with you. Our staff will feed your pet according to your instructions/wishes. 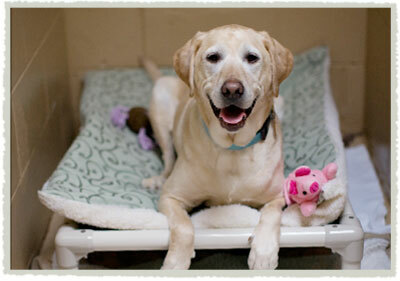 Feel free to bring your pet’s favorite toys and bedding if desired or we can provide this for them. You can pick up your pet any time of the day during normal clinic hours. An estimated time of pick up is helpful to make sure your pet is ready to go and has received a bath, if requested. If weekend drop offs or picks ups are requested, they will be discussed prior to your pet’s stay, but they are not always available. There is an extra half a day charge if you pick up your pet after 2 pm. Upon request only, we will give your pet a bath before they go home to ensure that your pet is clean when they leave our facility. Cat accommodations are also available. 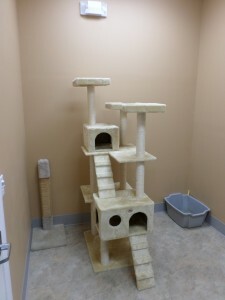 The cat room is separate from the dog area to keep your cat(s) comfortable and stress-free. Since the entire room is available to the pet, space is limited for cats so make your reservation in advance as possible. Your cat will enjoy getting the attention it deserves and a large cat tree for playing. We recommend you bring your pet’s normal food and treats. It will make your pet feel more at home if they get the same food as they do every day at home. When bringing food, make sure we have written instructions on how to feed your pet and provide typical feeding times. Your pet’s bowl and treats are optional, but it is a great way to make your pet feel at home during the stay. Labeling your pet’s items is also a great way to make everything clear for us when your pet comes in to stay. If medications are needed by your pet during the stay, please bring them in the original pill bottle with instructions on when to administer them. There is a nominal charge for this extra service. Other items like toys, beds, and blankets are welcome in our kennels, that way your pet can have their own personal belongings with them with the scent of your home. We may decide to return your pet’s leash and/or when you drop them off to ensure that it does not get damaged or misplaced. We try to make our boarding very affordable so it is a safe and convenient choice for both you and your pet. We do ask that you call a couple days ahead time so we can make sure we have space for your pet and everything will be set up. For dogs the rates depend on the size of your animal, please give us a call for an exact quote and availability. All cats are charged at the same rate. Discounts may be available for extended stays. Contact us below for details!